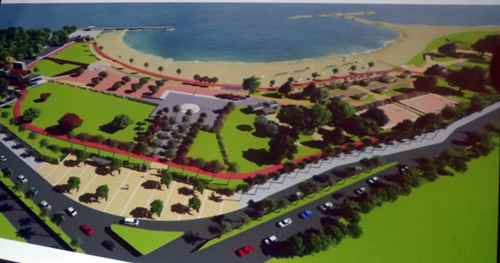 The government’s plan to establish a state-of-the-art beach park at Closed Harbour Beach, popularly called Dump Up Beach in Montego Bay, St. James, has moved a step closer to reality. This as the implementing agency, the Urban Development Corporation, UDC, has issued invitations for pre-qualification of building contractors. Tyrell Morgan, Communication Manager of the UDC, said the invitation for the collection of pre-qualification documents opened on Tuesday, January 9, and will close on January 29, 2018 at a cost of J$3,000. The documents should be submitted in sealed envelopes and deposited in the tender box at the UDC’s Head Office at or before 3:00 p.m. on Tuesday, February 6, 2018, while bids will open fifteen minutes later at 3:15p.m. Mr. Morgan indicated that the Tourism Enhancement Fund will be the main funding partner on the multi-million-dollar project, which had an initial cost of $700 million which he said is subject to change after the signing of the initial contract. Construction on the project is slated to commence in the third quarter of this year. The agency, in a release issued on Friday, indicated that the scope of the works will include widening of the sidewalk and new perimeter fencing along Gloucester Avenue and Howard Cooke Boulevard, while the interior of the park will feature a network of hardscape and landscape, public restrooms, changing rooms, beach showers, jogging trail, site filling and grading and support services including electrical, sewerage, storm water drainage and telecommunication. The intention is to convert the 16-acre property into a world class recreational space with amenities that will allow for it to operate as a free access licensed public beach and multi-purpose park. The beach will be the starting point of a public coastal park system to include the Old Hospital Park, and Gun Point Beach. The Closed Harbour Beach, which is a part of the UDC’s holdings in St. James, was created in the 1970’s on reclaimed land, and forms a part of the trifecta of beaches including Walter Fletcher and Gun Point Beaches. The construction will be carried out in tandem with the Montego Bay Waterfront Rehabilitation Project, a separate undertaking aimed at repairing the groynes protecting the Closed Harbour, Walter Fletcher and Gun Point Beaches. The restoration of the groynes is being partly funded by the Caribbean Community Climate Change Centre (5Cs) through the KFW Development Bank, which is providing $US 600,000. The rehabilitation of the groynes is expected to commence in April. Meanwhile, Councillor Homer Davis , Mayor of Montego Bay, gave the thumbs up to the project, citing that while it was long in coming, he was happy that another phase in the development of the city was soon to be undertaken, which would add to the asset stock for the citizens. He said with most of the public beaches having been taken away from the public, it was good that the UDC was acting in the best interest of the people to develop the area for public use.